Crafting products from leather materials is only effective using leather sewing machines. This is because leather sticks and is tough to penetrate especially when using ordinary sewing machines. 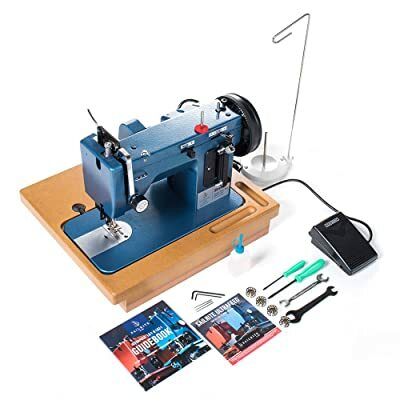 The best leather sewing machines look like the normal machines but are made of sturdy materials. Their feeding mechanism is complex and allows the machine to sew layers of the heavy materials. Also, leather sewing machines have a cylindrical arm that gives users the flexibility to move the fabric. Another feature that distinguishes these machines with the ordinary machines is the rotary blade cutters for working the saddles and harnesses. The blades also ensure a good finish by getting rid of fringes and frayed edges. 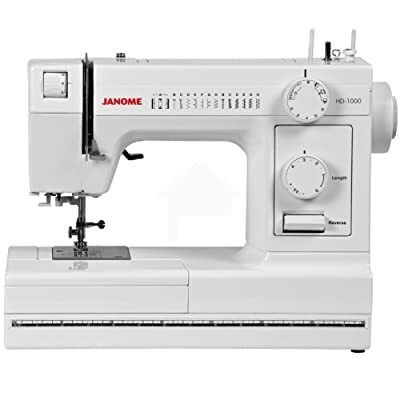 The Janome is a heavy duty leather sewing machine made of an aluminum body. All internal sections of the product are made of metal with some sections of the external covered with plastic. It has a stronger motor with an inbuilt needle threader. Another great feature is the reverse stitch lever that allows flexibility in sewing the fabric. It also comes with a foot pressure adjustment and allows for 18 stitches and a one-step buttonhole. This machine is a mechanical type sewing machine with an extra high presser foot for the left. It has a free arm with an automatic bobbin winding. It comes with a cover to protect the machine and allows thread adjustment through the thread tension adjustment. The product has a compartment that can be used to hold needles, thread and feet. The Sailrite can be used to sew up through heavy materials such as heavy canvas up to 10 layers, denim, and sailcloth. The product offers two times the power compared to the traditional system. This is because it has a power plus balance wheel. The clutching system is a Patented Posi-Pin that facilitates maximum power transfer to the needle from the balance wheel. It has a wide presser foot with a piping tunnel. Also, the foot lift is 3/8 inch. For stitching in a straight form, the stitch length recommended is 6mm. On the other hand, 5mm for the zigzag width. It is made of sturdy materials with a wooden base, stitch length plate, thread stand and an electronic foot control. Other accessories include four bobbins, sewing machine oil and a toolkit. The product also comes with a detailed guidebook that details the set-up, maintenance and use. It also has a two-year limited warranty. The 9960 Quantum is a hi-tech machine that used smart technology. The threading system is simplified by the automatic needle threader which takes about sixty seconds to thread the entire machine. The top drop-in bobbin system means that the bobbin is loaded from the top making it easy to insert. The clear cover that comes with the bobbin allows the user monitor the thread supply. The digital information advisor provides the user with stitch information making operation stress-free. The information provided by the advisor includes the stitch width and length settings, the selected stitch and recommended presser foot. All this information is shown on the clear LCD screen. 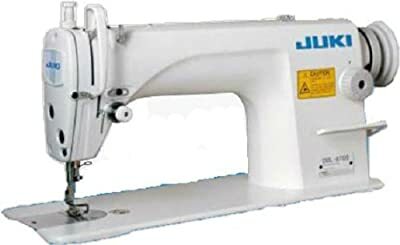 The product enhances buttonhole sewing as it has 13 fully automatic sized buttonhole styles. The buttonholes are sewn in a similar direction preventing fabric distortion and the formation of gaps. Different from the other machines, it contains 600 built-in stitches accompanied by a reference chart for guidance. The extension table provides a larger area for working on big projects such as quilting. It comes with free accessories which include 18 presser feet. The Consew can be able to sew materials that are light to heavy weight. These include vinyl, leather, canvas and synthetics. It stitches products such as covers, sails, tarpaulins, umbrellas among others. It has a large bobbin that ensures an extra long stitch. Also, the bobbin can be replaced without moving the material being worked on. For users operating heavy threads, a thread release finger is available to ease operation. The 14 mm high-pressure foot lift also makes work simpler. The arm lubrication is centralized with the micrometric control valve hooking the reservoir oil. The mechanism running the system is an all gear. The safety clutch feature has a push button re-arrangement that makes the use secure. The forward and reverse stitch can be adjusted to be equal in length. The center foot can also be moved up and down allowing sewing at varied material thickness assuring positive stitching. Many of the accessories are interchangeable other models of Consew such as 255RB-2 and 226R-2. When operating, the even feeding of the material is enhanced by the walking foot. The product is great for regulating patterns as the locking stitch regulators stop any changes with the stitch length during vibration. The machine is a product of Reliable that has a high-speed operation of 2,000 RPM. The hook part of the product has a large capacity. The foot lift size is 14 mm adequate for any user. Unlike the previously discussed system, the sewing machine is usually manually lubricated. It has a single row feed dog and all the components of the machine are tested and sewn before shipping to the customers. Accessories that come with the purchase of this product include a drawer, tool kit and a thread stand. The HD 1000 has an interior and exterior body made of Cast Aluminum making it durable. The four step buttonhole and 14 built-in stitches make working on projects fun. The length of the stitches is set using the adjustment dial feature. This setting allows stress-free switching of fine and heavy fabric. The threader, which is built-in, enables the user to get the thread in and out of the needle. Another amazing feature of the machine is the ability to lower the feed dogs. This action of switching the lever allows for a free motion quilting and sewing. When darning and stitching the buttonholes, the drop feed feature can be used. It also has a removable free arm allowing users sew small openings such as sleeves and pant hemming. This product ensures the flexibility of using a variety of materials by having a great feeding system. The feed dog system is three piece for smooth fabric feeding. A hard-sided cover protects the sewing machine when not operating. Accessories part of the package include a zipper foot, needles, blind hemming foot, bobbins, a general purpose and sliding buttonhole foot. This sewing machine is portable, user-friendly and computerized. It has 60 inbuilt stitches and 7-style buttonholes. The selection of stitch is through the touch of a button and the selection is displayed on an LCD screen. The user can easily adjust the sewing speeds using the stitch speed slide. Threading is simple as the machine has a numbered diagram printed that provides guidance. The automatic needle threader pushes the thread automatically through the needle. The product has an excellent work area with an oversized table to handle large projects. This work area allows maneuverability and flexibility. The product has a free arm that comes in handy when sewing sleeves and cuffs. The bobbin, eyelet punch, needle set, twin needle, seam ripper, cleaning brush, a screwdriver and extra spool pin are some of the accessories included. Additional accessories include a variety of foot and a quilt guide foot holder. The Singer 4423 has a total of 23 stitches inbuilt. They include 12 decorative, four stretch, six basic and one buttonhole stitch. The speed of sewing is 1,100 stitches per minute facilitate by its strong motor. 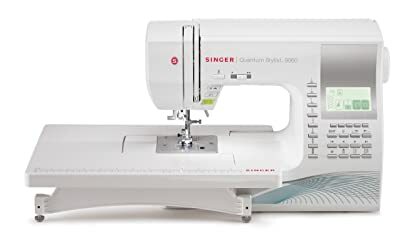 The materials making the sewing machine are sturdy with a bed plate made of stainless steel and a heavy duty metal frame. The stainless steel bed plate makes feeding of the fabric smoother. It has a top drop-in bobbin which is easy to insert and remove. Also, the bobbin has a clear view cover that allows monitoring of the thread supply. The automatic threader is set up to eliminate frustrations for the user during threading. Unique from all the other machines, the product has an assistant app to guide the user. The app provides information on new sewing techniques, tutorials and FAQs. The app is available on both iTunes and the Google play store. Accessories that come with the product come in the accessory tray and include a lint brush, bobbins, a quilting guide and foot control. Also included is a screwdriver, spoon pin felt, instruction manual, all-purpose foot, button sewing foot and an auxiliary spoon pin. 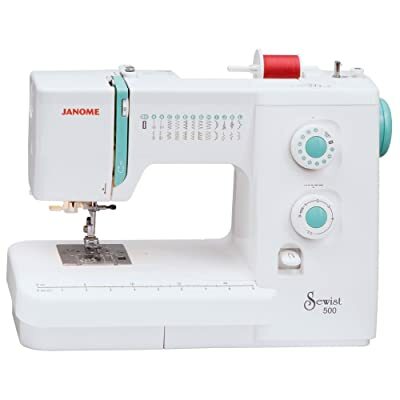 The Sewist 500 comes with 25 stitches which are a 1-step automatic buttonhole, stretch and utility stitches. The automatic threader reduces eye strain on the user by facilitating fast threading. The pressure foot feature allows the adjustment of pressure exerted on the fabric. The maximum stitching length is 4mm and width of 5mm. The stitching length and width is adjusted using the stitch length dial. The stitch selector dial assists in selecting a stitch from the selection. A free arm makes the sewing of cuffs, pants, collars, attaching buttons and free motion applications a smooth operation. The machine is protected during transportation and when not in use by the hard case. Like the other machines, it comes with accessories, for example, a felt, bobbins, button ripper and blind hemming foot. 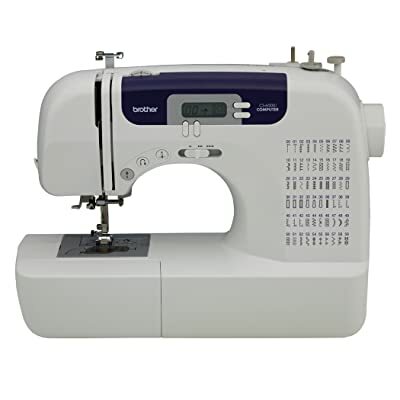 The DDL-8700 is an industrial sewing machine suitable for light to medium weight fabric. The dimensions of the product are 48 by 20 by 48 inches. The machine may be able to sew multiple layers of fabric when the right needle is used. It has a maximum sewing speed of 5500 stitches per minute. The maximum stitch length is 5mm. The motor that comes with the machine is strong with an 110V rating. The noise and vibration levels are reduced making it comfortable to operate. 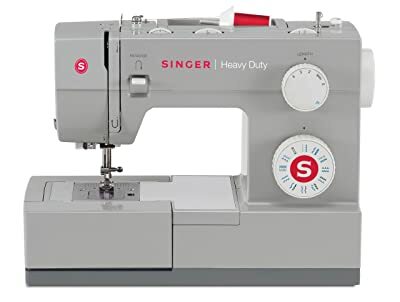 Depending on the type of leather sewing machine, the speed available for use varies from fast, moderate and a combination. Determine the number of products to create in a day to determine the speed required. This will enable make the right choice of machine. The products come with accessories. However, some of the brands provide a lot more than the basic accessories. Before making a decision, consider the accessories that you will need during the sewing process to make your work easier. It will also reduce the additional costs of getting accessories that you may need. There are many brands available in the market. It is important to consider a brand that provides quality of products and value for money. In addition, the manufacturer should be accessible and responsive in case of any issues with the product. Like discussed, there are four types of leather sewing machines. The difference between the machines is the material that can be used, the motor and machine size and the cost. These variables enable narrowing down to the type of machine appropriate. Sewing machines are complex, delicate and costly. Products with a favorable warranty are recommended. From the review of products, the warranty for some of the products lasts for about 25 years. The dealers should also be able to compensate or replace any damaged components during shipping or wrong assembly. The cost of the product should lie within the budget. To ensure that quality is not compromised due to the limit of funds, thorough research should be conducted beforehand. This is to ensure a good deal is gotten because there are some decent machines available at a lower price. Heavier threads are suitable for industrial machine type of projects. The light threads are suited for the domestic type of sewing machines. Heavy duty machines provide precise and great quality stitches. This is because they have powerful components that work effectively to give a perfect stitch. They also do not damage the fabric as their feeding systems are controlled and even. These types are suitable for lightweight grade leathers such as Nappa. They are not able to sew through the heavy leather fabric. Also, when using these types of machines, longer stitches are recommended to make the finish attractive. Heavier leather materials may lead to the burnout of the motor. These types work better than the home sewing machines. They have a greater power and large motors. These machines sew thinner leather better because of the greater torque. The torque is able to push the leather material. Also, they can handle thicker threads. These machines can handle layers of material up to 3/8 inch. They have a walking foot that is dual which feeds the material evenly. These machines are mostly heavy duty, portable with built-in walking feet. They are also able to stitch for a variety of products. The industrial type is the best suited for leather materials both heavy and light. They are larger than the other machines taking up more space. Their motors are large and are mounted on the table where the machine is attached. The triple feed walking foot ensures no harm comes to the leather as high-quality stitches are made. They are suited for individuals looking to set up a leather sewing business since they are quite expensive. Monitoring the tension on the thread to avoid breakage. Ensure that a tighter stitch is not adopted which may ruin the leather. Control on thread tension is taken care of by using a good leather sewing machine as opposed to the standard machines. Make use of the appropriate type of needle when sewing. The needles should be strong. Also, frequent replacement of the needles is advised. This will prevent jamming of the machine, breakage of needles and ruin of the product. It is advised to change the needle before a project and at a natural stopping point. Utilize stitch adjustments designed as dial commands or push-buttons. These adjustments strengthen the final leather product created. Use of synthetic threads instead of cotton thread so as to successfully sew through leather fabric. The best options include rayon and nylon. In cases where the leather does not slide easily when feeding, use powder to smoothen the movement. Leather is a thick and delicate material that requires more than the regular sewing machines to provide a perfect stitch. 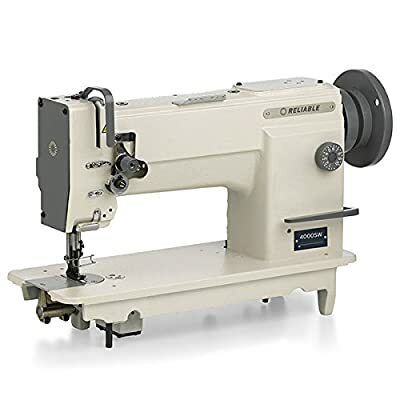 The best leather sewing machine is dependent on the type of machine, the thread used, cost and the quality of stitches. 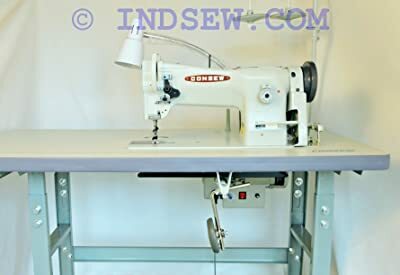 There are four types of leather sewing machines available in the market. To effectively use a leather sewing machine, it is important to consider the type and quality of thread and needle. Leather sewing machines work best with synthetic threads as opposed to cotton. To produce a high-quality stitch and prevent jamming of the machine, the needles should often be changed. Finally, from the ten reviewed products, I would recommend the use of the Brother cs6000i. 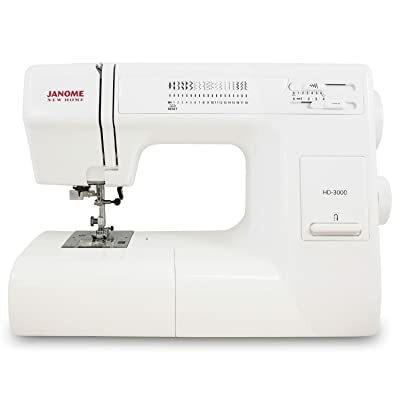 This is because it is able to use slow and advanced speeds when sewing. It makes it different from the other products which work with only one speed. Also, it is able to comfortably work with heavy clothes when the right needle is used. Finally, it has a decent warranty period of 25 years provided by the manufacturer.